Yesterday in the afternoon Atletico de Madrid was able to celebrate a major milestone at their new stadium construction site, in eastern Madrid. Estadio la Peineta saw the last segment of the roof’s compression ring installed atop the main stand (west). Now all of the white steel “crown” is in place. It consists of 32 pieces, each weighing 135 tons. This means a total of 4,320 tons were first transported from A Coruña and then lifted atop the stadium. The process began on July 21, eventually lasting 110 days. The next phase for roof construction will consist of cable-laying on the field and stands. 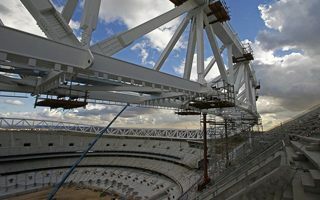 Once ready, the web of steel cables will be lifted into place, allowing for membrane installation to complete the roof. Once delivered, the canopy will become Atletico stadium's most iconic element.